There are a lot of different names for this, but Eggs in a Nest is what my mom always called it. Actually, my mom usually made hers in a muffin pan with the bread pushed into the cup to form a nest, but this is basically the same idea. I found that the use of hearty whole grain bread made it a bit difficult to get into the cup in one piece, so I started doing it this way instead. Other methods of making this call for a hole to be cut out of the bread with a cookie or biscuit cutter, and for the whole thing to be fried in a pan with loads of grease. I don’t do either of these things and I find it to be much easier.Start by buttering one side of the bread. Place the buttered side down on a cookie sheet (you can grease the cookie sheet, but I find that if I just slide the bread around a bit, it greases the spot underneath it just fine), and poke a hole in the middle of the bread. 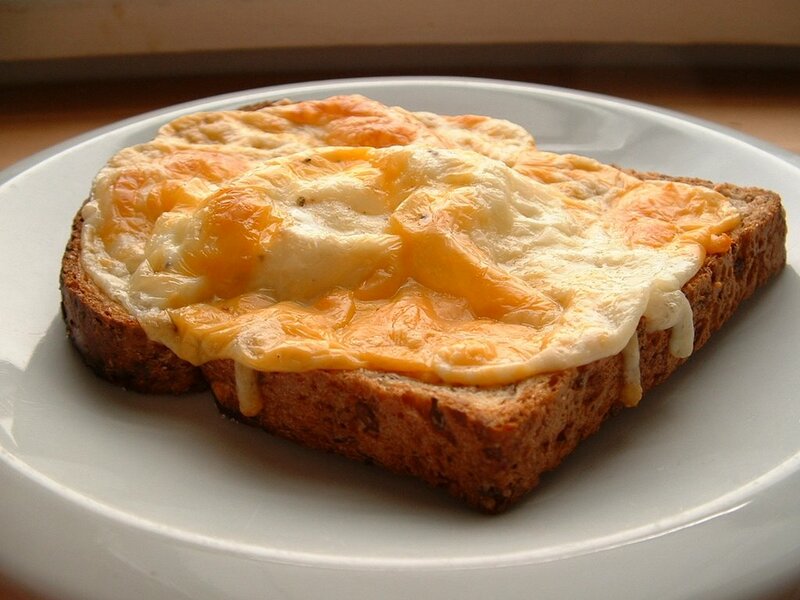 Using your fingers, squish the bread in the center towards the outer crust evenly in all directions, creating a nice egg-sized hole. 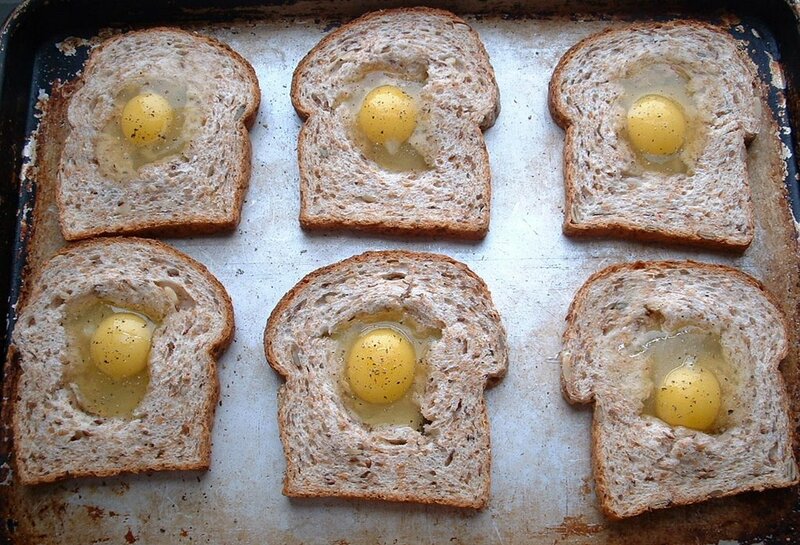 Break an egg into the hole you’ve made. Sprinkle with salt and pepper and then top with grated cheese. You can use any kind of cheese, but I particularly like cheddar with a bit of freshly grated parmesan (I used part skim mozzarella with just a little bit of cheddar today). Bake for about 15 minutes at 350 degrees (depending on how soft you like your yolks). My kids love to eat this for breakfast because they can eat it with their hands. Serve with a little ketchup or salsa (which turned out wonderfully despite my concerns) on the side, or dunk them into a pool of Frank’s Red Hot (my personal favorite). Wow those bring back memories. It’s been awhile since I’ve seen those. We always made them in a muffin tin as well. Such fun! Wow, they really are a universal thing. I love the name “one-eyed sandriches”! Lu – The oatmeal bread has a really nice flavour and texture, doesn’t it? Let me know what you think of the Farmhouse book. We called them “toad-in-the-holes” and we used a measuring cup or small juice glass to cut the hole. We’d then butter the hole and the bread and fry both with the egg. I still make them on comfort days, though my kids won’t touch them because the yolk is soft. Danielle – We don’t like runny yolks either, so we cook them until the yolks are rock hard and we can pop them out (they’re the dog’s favorite treat!). Toad-in-the-hole is a great name too. I’m beginning to think “eggs in a nest” is a little drab! Wow, I have actually never heard of these! What a great way to use up some homemade bread!!! And it looks quick, easy, and pretty nutritious!